The French circus, Cirque Du Soleil is famous all around the world for its spectacular stunts and mind-blowing acrobatic magic. It seems fitting then, that Mecca Bingo has teamed up with one of the most colourful and lively slots around to reward some lucky players with tickets to the big show. The slot we’re talking about is Kooza, and if you haven’t played it yet, you’re in for a real treat. So sign in to Mecca today for your chance to win one of the most dazzling prizes around. As well as high jackpot prizes waiting to be won on the reels of Kooza (we’ll tell you a bit more about that in just a moment) you could win tickets to see Cirque Du Soleil with this grand prize draw. If you’re lucky enough to scoop up one of these winning tickets, you’ll be jetted off to London, Rome or Vienna (with a plus-one) to watch the groundbreaking show and create memories that will last a lifetime. However, if astonishing acrobatics and circus acts aren’t exactly your thing, you could opt for a cash alternative of £2000. Ten people will be announced for this grand prize but there will also be hundreds more runners-up who walk away with varying amounts of cash. 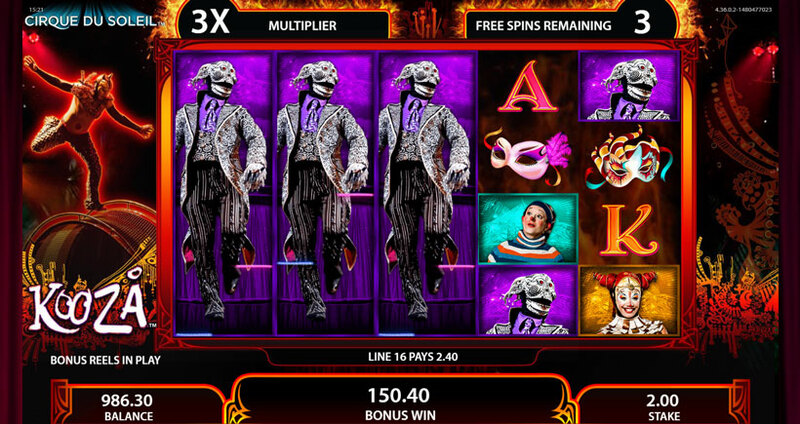 Kooza was created by Bally Technologies, one of the most trusted names in the game of online slot development. Coming from Bally, it will be no surprise to slot enthusiasts that this game is incredibly high quality with gorgeous graphics galore. The five reels and 40 pay lines are decorated with bold, colourful imagery and symbols that depict anything and everything to do with ‘The Big Top’. One of the best things about the slot is its generous Bonus Wheel feature which has rewards players with four extra games with amazing prizes such as free spins and multipliers. Entering the prize draw for Cirque Du Soleil is incredibly simple. All you have to do is sign in to Mecca Bingo during the promotional period; December 1st to 7th, and wager £10 or more of the Kooza slot. Every £10 you stake on the slot during this time will earn you one entry into the prize draw and boost your chances of being one of the lucky ticket (or cash) winners. Sign in and start spinning now for your chance to win this once-in-a-lifetime experience. 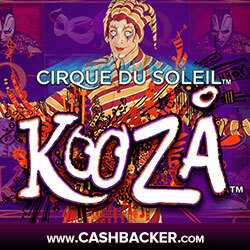 Please remember that only cash staked on the Kooza slot during the promotional dates will count towards the prize draw. Winners will be named on December 12th when the winning tickets are drawn at random. Make sure that the site has your correct contact details on file as any winners who have not claimed their prize within five days of the draw will forfeit the reward and it will be passed on to another winner.